Are disabling and enabling foreign key constraints supported in SQL Server? Or is my only option to drop and then re-create the constraints? If you are deleting all the data you may find this solution to be helpful. Also sometimes it is handy to disable all triggers as well, you can see the complete solution here. Your best option is to DROP and CREATE foreign key constraints. I didn't find examples in this post that would work for me "as-is", one would not work if foreign keys reference different schemas, the other would not work if foreign key references multiple columns. This script considers both, multiple schemas and multiple columns per foreign key. Pay attention to the double CHECK CHECK when enabling. ALL means for all constraints in the table. The SQL-92 standard allows for a constaint to be declared as DEFERRABLE so that it can be deferred (implicitly or explicitly) within the scope of a transaction. Sadly, SQL Server is still missing this SQL-92 functionality. For me, changing a constraint to NOCHECK is akin to changing the database structure on the fly -- dropping constraints certainly is -- and something to be avoided (e.g. users require increased privileges). I do agree with you, Hamlin. When you are transfer data using SSIS or when want to replicate data, it seems quite necessary to temporarily disable or drop foreign key constraints and then re-enable or recreate them. In these cases, referential integrity is not an issue, because it is already maintained in the source database. Therefore, you can rest assured regarding this matter. For the OP, kristof's solution will work, unless there are issues with massive data and transaction log balloon issues on big deletes. Also, even with tlog storage to spare, since deletes write to the tlog, the operation can take a VERY long time for tables with hundreds of millions of rows. I use a series of cursors to truncate and reload large copies of one of our huge production databases frequently. The solution engineered accounts for multiple schemas, multiple foreign key columns, and best of all can be sproc'd out for use in SSIS. It involves creation of three staging tables (real tables) to house the DROP, CREATE, and CHECK FK scripts, creation and insertion of those scripts into the tables, and then looping over the tables and executing them. The attached script is four parts: 1.) creation and storage of the scripts in the three staging (real) tables, 2.) execution of the drop FK scripts via a cursor one by one, 3.) Using sp_MSforeachtable to truncate all the tables in the database other than our three staging tables and 4.) execution of the create FK and check FK scripts at the end of your ETL SSIS package. Run the script creation portion in an Execute SQL task in SSIS. Run the "execute Drop FK Scripts" portion in a second Execute SQL task. Put the truncation script in a third Execute SQL task, then perform whatever other ETL processes you need to do prior to attaching the CREATE and CHECK scripts in a final Execute SQL task (or two if desired) at the end of your control flow. Storage of the scripts in real tables has proven invaluable when the re-application of the foreign keys fails as you can select * from sync_CreateFK, copy/paste into your query window, run them one at a time, and fix the data issues once you find ones that failed/are still failing to re-apply. Do not re-run the script again if it fails without making sure that you re-apply all of the foreign keys/checks prior to doing so, or you will most likely lose some creation and check fk scripting as our staging tables are dropped and recreated prior to the creation of the scripts to execute. WITH CHECK CHECK is almost certainly required! This point was raised in some of the answers and comments but I feel that it is important enough to call it out again. Re-enabling a constraint using the following command (no WITH CHECK) will have some serious drawbacks. No existing data in the table will be evaluated during the execution of this command - successful completion is no guarantee that the data in the table is valid according to the constraint. During the next update of the invalid records, the constraint will be evaluated and will fail - resulting in errors that may be unrelated to the actual update that is made. Application logic that relies on the constraint to ensure that data is valid may fail. The query optimizer will not make use of any constraint that is enabled in this way. The sys.foreign_keys system view provides some visibility into the issue. Note that it has both an is_disabled and an is_not_trusted column. is_disabled indicates whether future data manipulation operations will be validated against the constraint. is_not_trusted indicates whether all of the data currently in the table has been validated against the constraint. 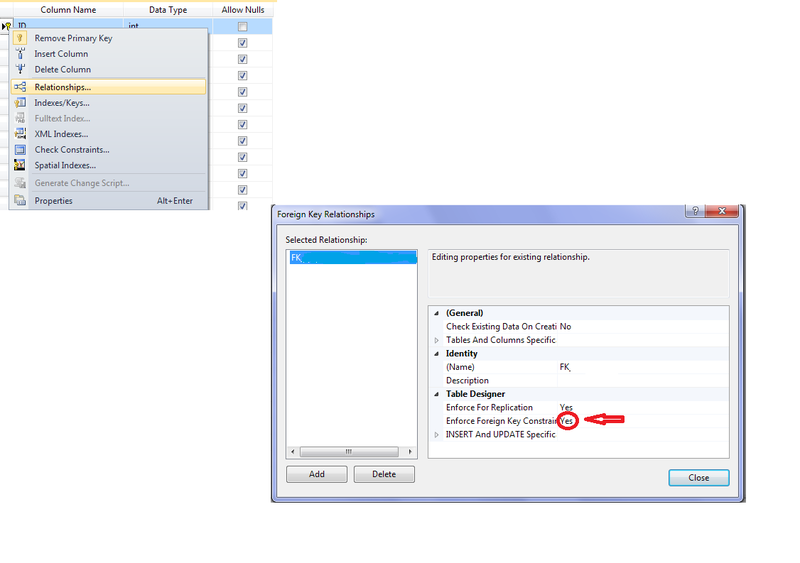 Note: Added solution for droping the constraint so that table can be dropped or modified without any constraint error. Right click the table design and go to Relationships and choose the foreign key on the left-side pane and in the right-side pane, set Enforce foreign key constraint to 'Yes' (to enable foreign key constraints) or 'No' (to disable it). Answer marked '905' looks good but does not work. Following worked for me. Any Primary Key, Unique Key, or Default constraints CAN NOT be disabled. In fact, if 'sp_helpconstraint '' shows 'n/a' in status_enabled - Means it can NOT be enabled/disabled. even though violating this constraint will produce an error that doesn't necessarily state that table as the source of the conflict. You can temporarily disable constraints on your tables, do work, then rebuild them. I have a more useful version if you are interested. I lifted a bit of code from here a website where the link is no longer active. I modifyied it to allow for an array of tables into the stored procedure and it populates the drop, truncate, add statements before executing all of them. This gives you control to decide which tables need truncating. Not the answer you're looking for? Browse other questions tagged sql-server tsql foreign-keys constraints or ask your own question. How do you truncate all tables in a database using TSQL? How do I copy SQL Azure database to my local development server? SQL Server: How to make server check all its check constraints? How do I drop all foreign-key constraints on a table in Sql Server 2000?